Fantastic! Thank you, Stefan. 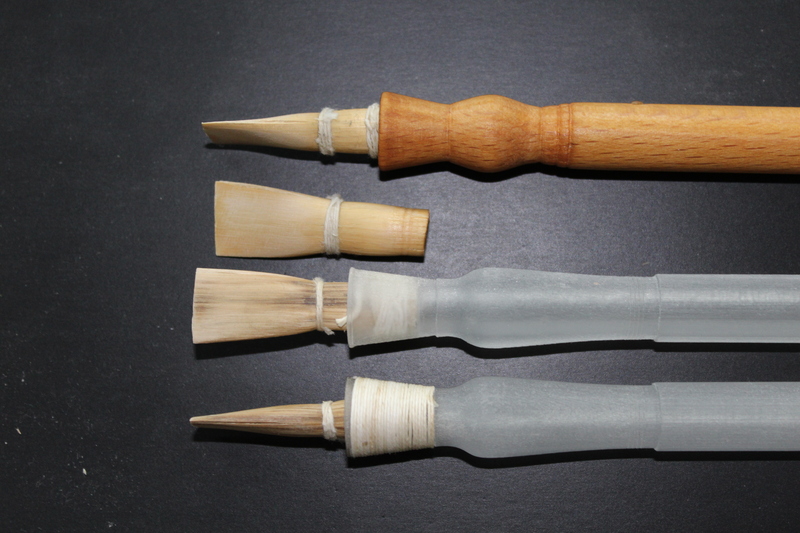 I’m itching to try making reeds like this for my early Highland bagpipe chanter. Did you tie both the hot-soak constrictions (at the waist and foot of the reed) around a 6mm rod? I wonder if it is necessary to squeeze the bulge above the waist (the ‘belly’) as much as you have. The iconography appears to suggest either a fatter ‘belly’ and ‘bottom’, or a narrower waist, or probably a bit of both. Have you tried tying the waist around a smaller diameter rod? 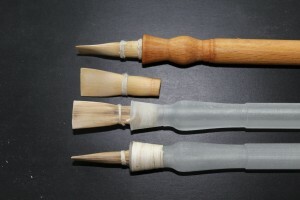 The tip of an oboe staple is slightly oval, with a minor axis of 1.8-2.4 mm and a major axis of 2.4-3.2 mm (www.oboecentral.com.au/page15.php). Are there any more results for reedmaking? How was the reedmaking workshop in Tarquinia? Did you find out new aspects which are important eg. measurements, way or position of pressing the lips?